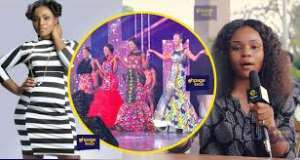 2015 TV3 Ghana’s Most Beautiful finalist, Akosua Sika Ayiwa has revealed that a staff with the TV3 network, organizers of the competition demanded to sleep with her in order to help her make it into the house during the auditions. According to Sika, she missed out in the Kumasi audition so she approached one of the judges of the auditions for help. The judge offered to train her for the Accra audition so she subsequently bought the forms for the Accra auditions as advised. The judge then directed her to go and see a certain man (The staff). But indirectly, she was being pimped to the man. The man requested she comes to his house but she felt something wasn’t right so refused to go and that pissed the man off. She performed very well during the Accra audition by herself and she was picked. When she entered the Ghana’s Most Beautiful house, she found out the same man had proposed to all the contestant in the house. Sika Said: “I actually wasn’t picked at the Kumasi audition and I had to talk to one of the judges so that is when the problem started.